Beers Made By Walking has partnered with the Forest Park Conservancy for a series of beer-themed hikes and Forest Park-inspired beers. Local brewers were invited onto public hikes throughout the summer and have created beers and plants inspired by the trails. The tapping event takes place on September 15, from 5pm – 8pm at Bazi Bierbrasserie in SE Portland. The featured beers come directly from a collaboration with the Forest Park Conservancy, which sent experts to lead monthly public hikes with brewers in Forest Park. Hikes took place on various trails throughout Forest Park. “Cumulatively, the beers create a drinkable landscape portrait of Forest Park,” says Eric Steen, founder of BMBW. 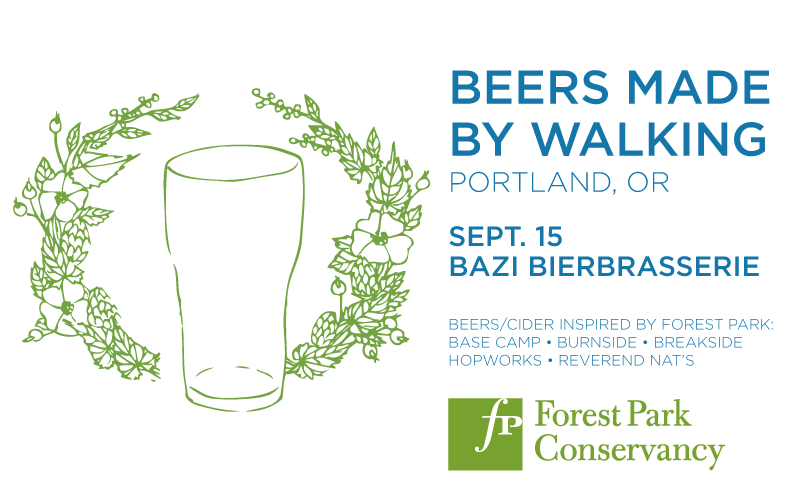 A percentage of the beer sales on September 15 will support the Forest Park Conservancy’s work restoring Forest Park. Participating breweries include: Base Camp Brewing, Breakside Brewing, Burnside Brewing, Hopworks Urban Brewery, and Reverend Nat’s Hard Cider. The Forest Park Conservancy protects and fosters the ecological health of Forest Park, maintains and enhances the park's extensive trails network, and inspires community appreciation and future stewardship of this iconic, urban wilderness as a gift for future generations.